Confession: I am an introvert. I realized this pretty quickly when I took one of those self tests and got to the question about whether I was energized after being in the company of others, or whether I felt drained. Before I gained employment in my current position at Luma, I always worked with people…in an office…where social relationships often blurred the perception of my work product. I have always been a conscientious worker, but the social component usually left me feeling like less than a stellar employee. I would opt to skip the office parties, breakfasts, and employee lounge small talk, and instead tuck myself in at my computer with coffee. This tendency can alienate coworkers, and so I, the introvert, would feel outside the team. I do like people, really. I just fall short in the various facets of office socialization. I fail at chit-chat, I am very private and don’t share much about my personal life. I don’t like eating public snacks, and some people are greatly offended when you don’t want to eat their wonderful lemon meringue bars. I have a highly defined sense of professional boundaries and acceptable office behavior, and when you decline an invitation for afterwork cocktails, people begin to suspect you’re a snob. I have also been accused of scowling most of my life, even though I can’t see my own face and am not typically aware of this. All of these proclivities have undermined my true abilities as a team player. My professional conflicts dissolved when I became a remote worker. (Cue ethereal music.) Suddenly, my work speaks for itself and I don’t have to step into a role. I can finally be myself without worrying that if I don’t join the office gang for muffins and charades, I’m going to get passed up for that promotion. In a virtual team, your work tends to be front and center over your personality and willingness to socially participate. Remote work has been the answer I’ve been seeking, and I feel like things finally click. After working with a virtual team, I’ve learned about some of the unique benefits and challenges of not primarily being face-to-face with your coworkers. Remote work is proliferating globally, and we are seeing a drastic change in the nuances of professional relationships. Analyses of workplace trends demonstrate an increasing global shift from the traditional 9-to-5 cubicle to that of working from home. The benefits from this burgeoning situation are numerous for employer and employee alike: increased worker productivity, lower overhead costs, not to mention job satisfaction (introverts everywhere, celebrate!). As we experience more of this workplace paradigm shift, it is important to consider key differences between the virtual and face-to-face office. Have you ever experienced a misinterpreted tone or joke in an email? Ever think you are being all-caps shouted at? I think we all have. In a virtual environment, we often don’t have facial expressions, posture, tone of voice, and eye contact helping us interpret each other’s message. 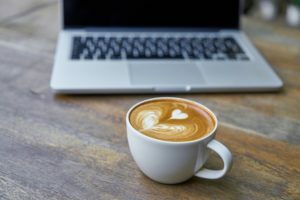 In the years I’ve been working remotely, I’ve learned several tips that make for effective communication in the virtual office, without feeling like you are sacrificing your personality. Tip #2 Build Trust with Communication: To Message! Or not to Message! In an asynchronous work schedule, I like to error on the side of over-communication. It is imperative to realize that not responding can be construed as a response, and it’s often not a good response. Also, your coworker could be several time zones away and is waiting to proceed until you respond. Sometimes, just an acknowledgement of receiving someone else’s message is appropriate. This can demonstrate that you got this! and they can mentally let go. It is important that you are accessible and responsive, and be sure to convey your “blackout” times during which you will not be available. Craft your messages succinctly to prevent your coworkers from feeling overwhelmed or confused. Longer discussions are best saved for oral communication via a phone call or video conference. Be mindful of your audience when discussing sensitive information: conflicts and corrections might be better saved for one-on-one rather than a project management forum. No one likes to be publicly humiliated. However, working on a team requires willingness to acknowledge and work through conflict with others, so you can experience a deeper team cohesion by encouraging open discussion when there is an issue. Be honest when you’ve messed up, and focus instead on the team goal of getting it right. Communication with your teammates should mirror good listening skills, even if you’re reading and not “listening,” not only to demonstrate your collaboration initiative, but to clarify understanding. It helps to rephrase your teammate’s message back to them just to ensure you both are of the same mind. Sending a message like, “Just so I’m understanding, I need to…and you’re going to…” can prevent frustration, wasted time, and bad feelings. The content of your messages should clearly state your expectations and leave little room for misinterpretation. When ping-ponging tasks, you should conclude episodes of discussion with “I will” and “So you will” statements that concretely define the plan of action. Your own workplace culture can dictate the appropriateness of utilizing ideograms in online interactions (e.g., emojis, emoticons, etc.) but a well-placed emoji can go a long way in presenting a message in friendly context. Be aware of overuse, however- you don’t want to sacrifice professionalism for the sake of friendliness. Also screen your messages for unintended emotional implications, like over-punctuation or all caps (DO YOU KNOW WHAT I MEAN???) The essence of many messages have been misinterpreted due to inattention to these facets of communication. After focusing solely on the task-related side of building trust, I would be remiss to completely neglect the social aspects to this process. In some cases, periodically gathering teammates together for a recreational event might be impossible. So it is helpful to provide a forum for teammates to chat about non-work related issues and get to know each other. Learning about your coworker’s life behind cyberspace can improve your interaction and deepen your understanding about their worldview. This is all very beneficial to team cohesion. And the occasional margarita might not hurt either.